Options: 14 lb. 28 lb. Formulated to provide the taste he loves and the nutrition he needs for physical well-being and good health. Made with a precise balance of protein, fat and carbohydrates, Large Breed formula provides the special diet large and giant breed dogs need for bones, joints and overall good health. Chicken meal provides a high quality protein source. The grain-free formula combined with high quality, wholesome vegetables and fruits such as peas, apples, blueberries, carrots, spinach and cranberries help meet your dog's nutritional needs. Chelated minerals are easily absorbed into the tissues of your dog’s body for optimum nutrition. Fortified with glucosamine and chondroitin sulfate, Large Breed formula helps maintain healthy joint cartilage. L-Carnitine helps burn fat and maintain lean muscle mass to support a healthy, active lifestyle. A proper ratio of Omega-6 and Omega-3 fatty acids helps support a lipid balance for healthy skin and coat. Made without grain or gluten, this special formula is perfect as a grain-free alternative diet. A standard 8 oz. 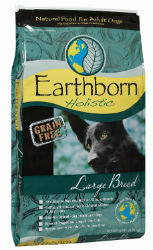 measuring cup holds approximately 3.9 ounces of Earthborn Holistic® Large Breed. 3500 (M.E. Calculated, as fed) kilo-calories per kg/370 (M.E. Calculated, as fed) kilo-calories per cup.